If you’re not already in love with cod, then your meals are about to get a whole lot more exciting. This seafood option has some serious power in the nutrient department, and it also happens to taste delicious. So, what makes cod so special? Wild caught Alaskan cod is loaded with essential nutrients and brain-boosting benefits. It is incredibly high in protein while also low in calories and low in fat. In a 3-ounce serving you get only 70 calories, 16 grams of protein and zero saturated fat . Cod is also a good source of B vitamins, which benefit both digestive health and your skin. And Alaskan cod happens to also contain high amounts of phosphorus, which helps protect bone health among other perks. Cod is also packed with omega-3 fatty acids, which help with brain development and help protect against cognitive decline as you age. And these omega-3s aren’t just important in reducing the risk of mental health conditions or deterioration; they also help maintain a healthy brain and improve cognitive functioning, even in healthy individuals. Thanks to the omega-3 content, cod is also really beneficial in terms of heart health. According to the American Heart Association, “omega-3 fatty acids decrease risk of arrhythmias (abnormal heartbeats), which can lead to sudden death. Omega-3 fatty acids also decrease triglyceride levels, slow growth rate of atherosclerotic plaque, and lower blood pressure (slightly)” . Cod has a mild, clean, lightly sweet flavor, and the tender, flaky fish and takes on the flavors of the seasoning and sauce it is cooked in. Even people who claim to hate fish, or kids with very picky taste will love cod. Whether you prefer baked fish, grilled fish, steamed or roasted, cod is so versatile that it can be prepared in almost any way your heart desires. Cod is firm but tender, so it holds up nicely whether it is pan-fried, poached, baked, broiled, steamed or even grilled. It will be flaky when pierced with a fork, but as the cod is cooking it won’t fall apart, making it perfect for even an amateur cook. And because the flavor is so mild, it will absorb the flavors you choose based on your seasoning, any aromatics you like, or any marinade you have on hand. Soup season is fast approaching and you should add cod to your culinary arsenal for soups, stews and chowders. It’s a perfect fish for these warm, comforting dishes thanks to the firm texture that holds together nicely while your broth simmers. If your kids love fish sticks, cod makes a great base for fish and chips or a healthier option of baked fish sticks. On taco Tuesday you can ditch the ground beef or grilled chicken and opt for fresh cod, which makes a perfect taco filling that is flavorful and nutrient-rich. For your tacos you can choose to grill, bake, sear or fry your fish, and because cod is so mild on its own, it really absorbs the flavors of the taco seasoning. Here are some of our favorite cod recipes to help you get started. It is possible to make fried fish tacos that are delicious but also not terrible for you and also easy to make. The cod is coated in coconut flour and flakes, then fried in ghee (or butter if you choose) and served on top of warmed tortillas with arugula and avocado. There are tons of varieties and add-ons when it comes to cod tacos, but this recipe is our fave. If you want to make the dish a tad lighter, opt for grilled fish, and feel free to improvise with the toppings. If the words “buttered” and “skillet” don’t make your mouth water, then you’ll have to trust us on this: this cod dish is absolute perfection. It also happens to be really simple to whip up and takes almost no time to make. And the best part is the cod can be served with anything you want — with salad, over rice, pasta, on top of grilled bread — the possibilities are endless. And while the dollops of butter on top of each piece of cod are what make the dish so decadent, you can always lighten it up by reducing the butter content and adding a bit more olive oil or lemon juice to suit your needs. 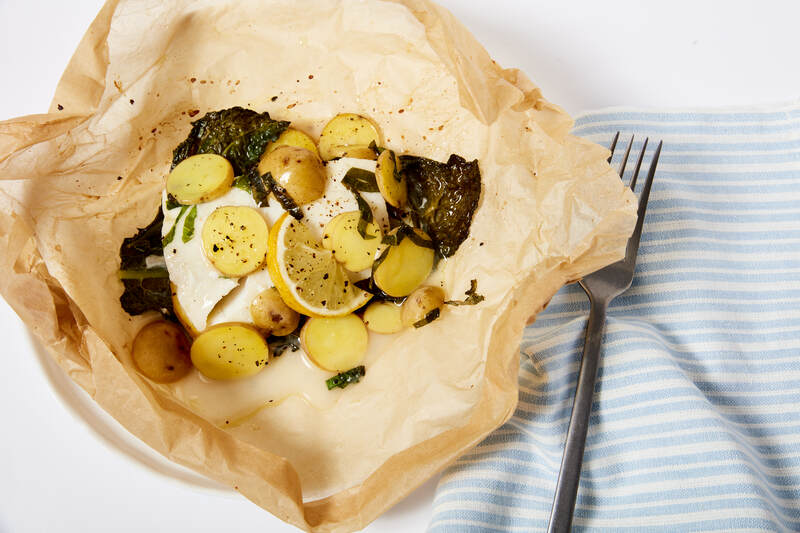 Parchment paper is one of the greatest tools when it comes to baking fish. It keeps your dish tidy and makes cleanup a breeze. It traps all of the flavors from your seasoning and aromatics so that they can be infused into your fish for maximum impact. And above all, it helps cook your fish evenly and efficiently so you end up with a tender, moist, flaky cod that is cooked to perfection. This dish mixes tons of Mediterranean herbs and fresh vegetables with the fish, and then the finished product is topped with amazing chive butter.